GOETTL FARMS IS A FAMILY OWNED FARM THAT WAS ESTABLISHED IN 1957 BY WILFRID AND LAVONNE. GOETTL FARMS IS CURRENTLY BEING OPERATED BY ROBERT AND LORI GOETTL ALONG WITH THEIR SON JUSTIN GOETTL WITH HIS WIFE AND 4 KIDS (3 GIRLS, 1 BOY). WE SUSTAIN 2900 ACRES, MOSTLY CORN AND SOYBEANS IN ROTATION WITH OCCASSIONAL CANNING CROPS LIKE SWEET CORN OR PEAS FOR A LOCAL CANNING COMPANY AND OCCASIONAL WHEAT FOR A LOCAL FLOUR MILL. 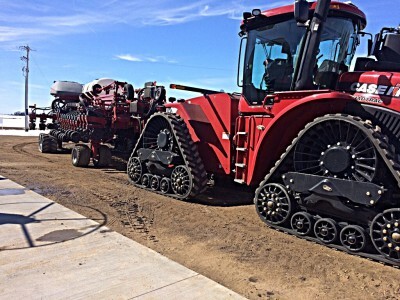 GOETTL FARMS UTILIZES THE LATEST IN PRECISION FARM EQUIPMENT, SEED TRAITS, AND AGRONOMIC PRACTICES. WE PLANT WHEN THE TIME IS RIGHT, USE THE 4R’S OF PRODUCT PLACEMENT, USE BEST MANAGEMENT PRACTICES FOR CROP PROTECTION, INSTALLING TILE AND DRAINAGE TO SAVE NUTRIENTS AND KEEP THEM IN THE SOIL NOT OUR WATERSHED AND WE EVEN MOW/CONDITION OUR LANLORDS PROPERYS AND/OR RIGHT OF WAY OR DITCH EDGE. ALONG WITH THE FAMILY FARM WE KEEP BUSY THROUGH OUT THE YEAR SELLING AND RETAILING PRODUCTS THAT WE HAVE TRUST AND FAITH IN AND HELP US ACHIEVE THE HIGHEST ROI AS WELL AS HELP REACH THE HIGHEST YIELDS WE CAN PRODUCE IN OUR GEOGRAPHY. FROM THE BEST GENETICS OF THE BECKS LINEUP TO THE MOST EFFICIENT SOURCE OF FERTILIZERS FROM AGROLIQUID. WE ALSO SELL AND CUSTOM SPREAD, GYPSOIL BRAND GYPSUM, pH PLUS, AND AG LIME. GOETTL TILING LLC IS A SMALL TIME TILING AND DRAINAGE OPERATION WE DO AS WELL.